No, sleep ’til Brooklyn… or Staten Island or Queens or the Bronx or Manhattan. – Don't make me turn this van around! 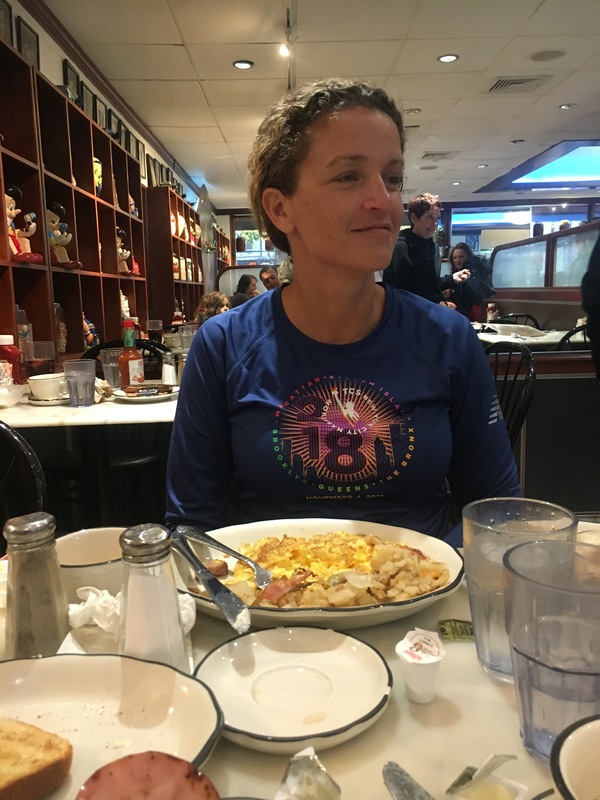 Nearly six months after Monica was accepted on the John Ritter Foundation team for the New York City Marathon, it was time to see if all those early wake-up calls, all those long runs, and all the moans and groans had paid off. She packed, and repacked her bags to make sure nothing was missing. She had a 24 pack of energy gels. 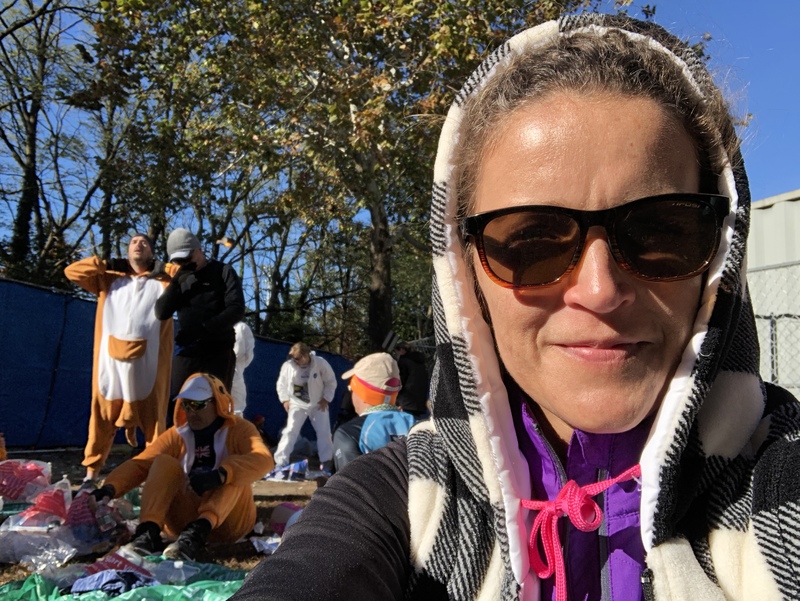 She had multiple spare blankets and sweaters to hand over to Goodwill after her wait at the starting line. Each item of clothing was battle tested on long runs and evaluated for fit and chafing. Chafing is an obsession for runners as they repeat the same motion for 26 miles. Monica has been focused on making sure that she doesn’t deviate from what has worked during her training. That means we packed a small toaster in our luggage so that she could eat the same filling and protein rich combination of toast, peanut butter and banana that she eats every morning at home. We’re #2! If you have to be stuck in an airport, Tampa isn’t a bad one. Consistently rated #2 behind Portland, Oregon. When you have a nice airport nearby you forget that other people have to fly out of places like Seattle (so small and crammed) and Cleveland (don’t get me started on their security setup). 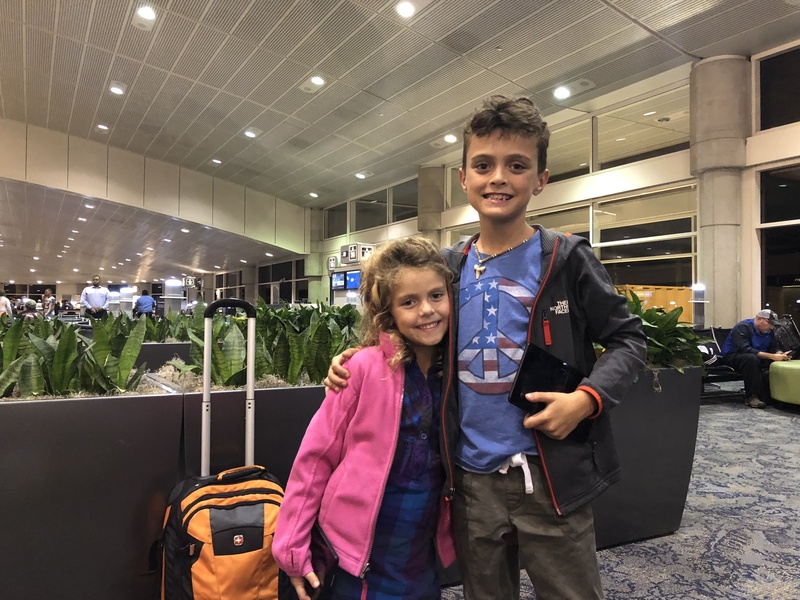 We packed up the kids and headed to New York. But day one got off to a rocky start. It’s a bad flight when the flight attendant is scared. Upon arrival, Monica began experiencing remorse over our choice of hotel. See, we were initially booked in the Loews Regency Park Avenue – a ridiculously nice hotel with a prime location. And a hefty price. 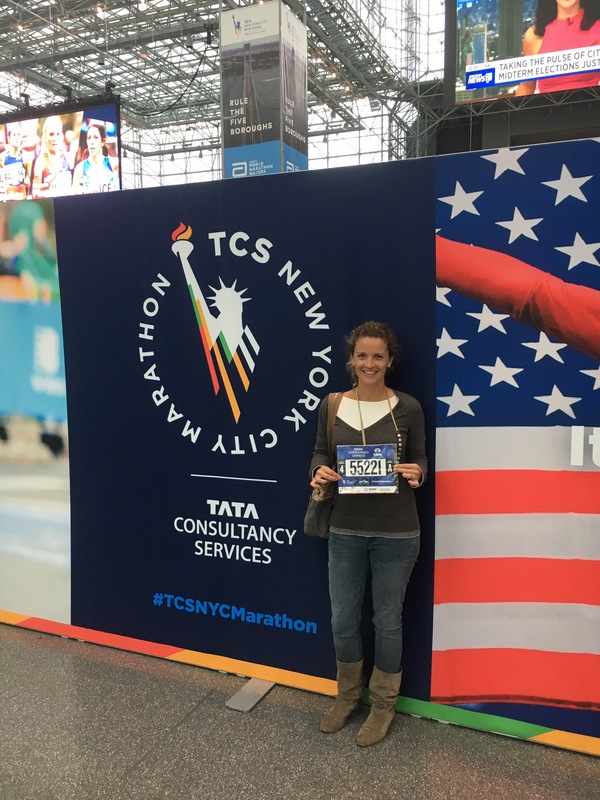 We’d scored a good deal on a suite there before, but this time we booked a standard room – and there are no deals on marathon weekend. 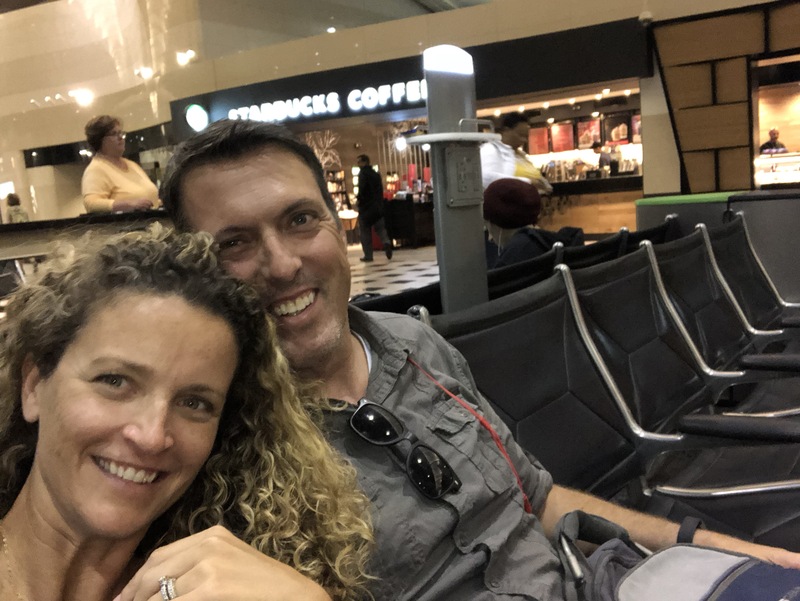 A few days before we left, Monica changed our reservation to a suite with kitchenette at a less luxurious hotel in Midtown that we’d stayed in before. We took our room on the 15th floor and marveled at the city views. And the noise. Night 1 was rough. The “King Suite” featured a queen bed, a pullout couch, and early morning construction noise so you don’t need an alarm. Monica was concerned. It’s never a good sign when the hotel provides ear plugs. But hey, it’s New York. Construction is a way of life. Horns honking. The sound of anvils falling down elevator shafts at three in the morning. 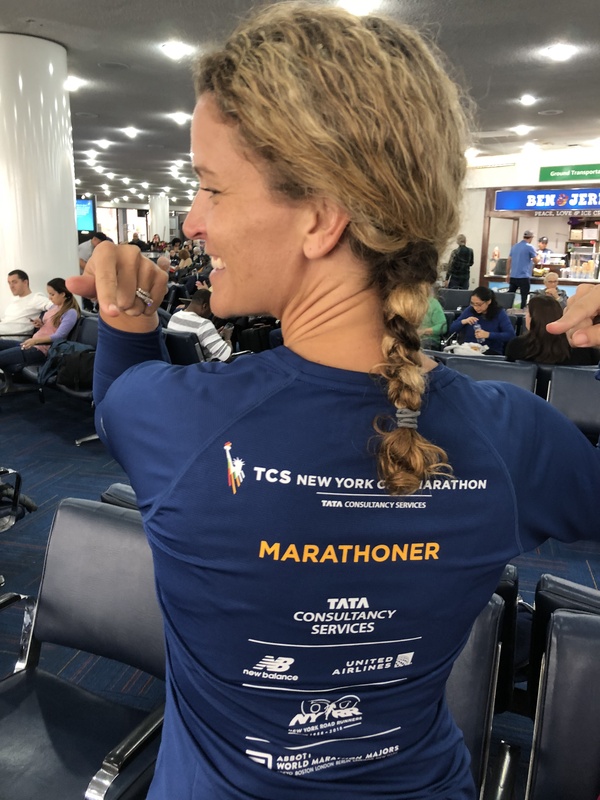 They don’t call it “The city that never sleeps before a marathon” for nothing. Monica went to the front desk and pleaded for help. The receptionist was … receptive. She went as far as to walk Monica to an alternate room facing a different section of the hotel, straight in to someone else’s room – and much quieter. Problem solved. Monica celebrates our crappy view! 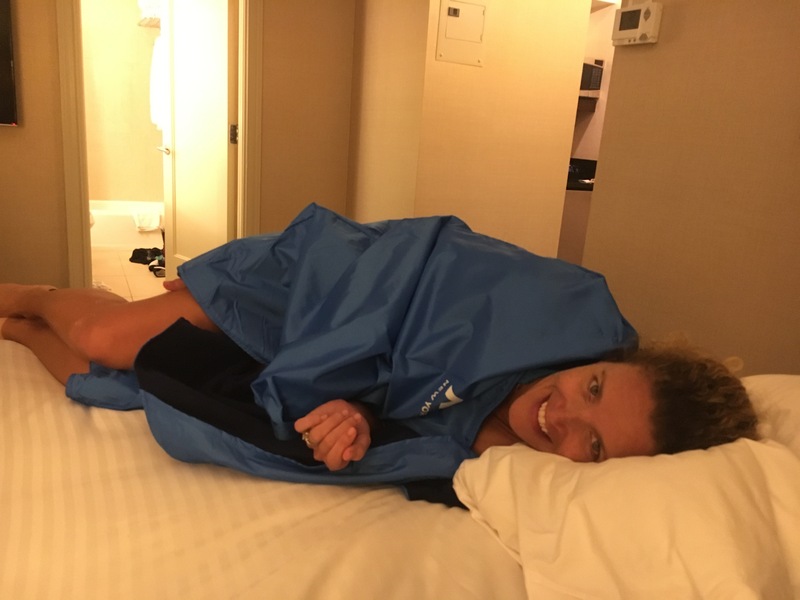 She also commandeered an entire bed to herself and we kicked one kid to the floor for the night before the race. What a diva! The day before the marathon, we had a couple of race related tasks. 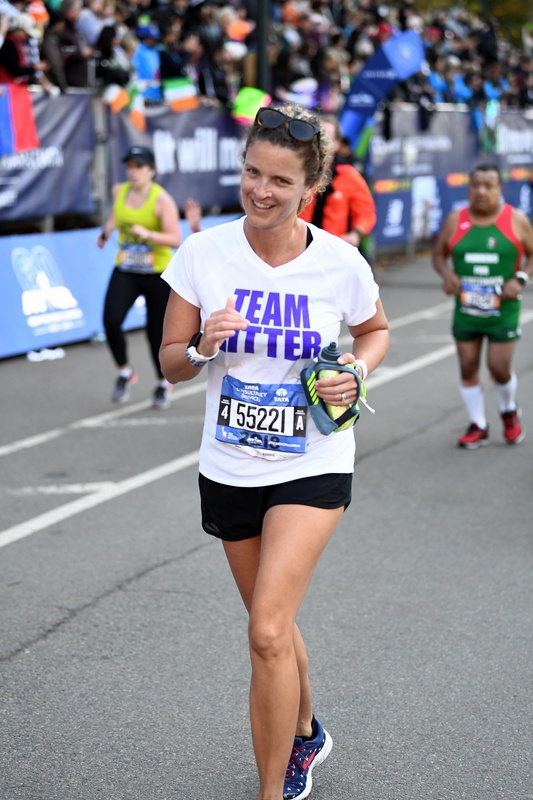 First, we had to get Monica’s bib at the expo, and we had a meet and greet with the Ritter Team. The John Ritter Foundation supports research and awareness of diseases of the aorta. 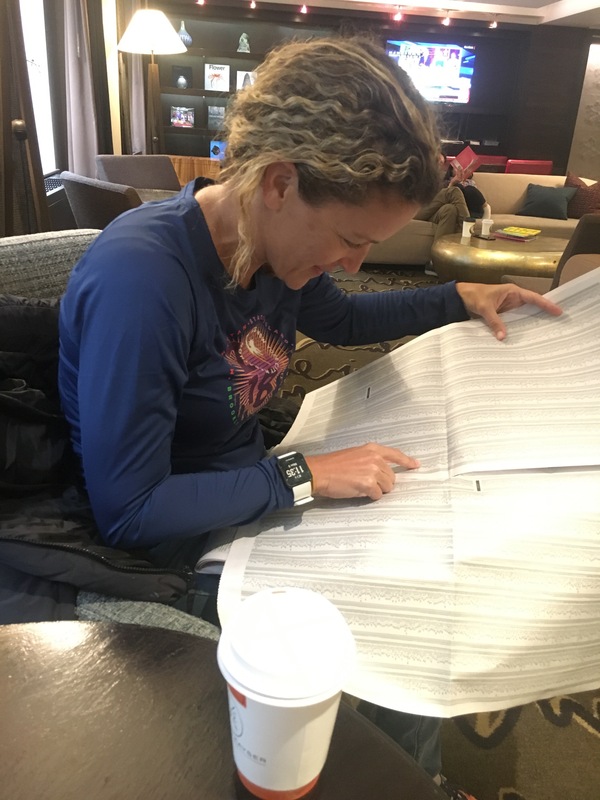 I know that it’s not their first rodeo, but marathon organizers distribute over 50,000 bibs in a way that’s orderly and fun. If you’re going to lose your luggage before a race, this is the place to do it. 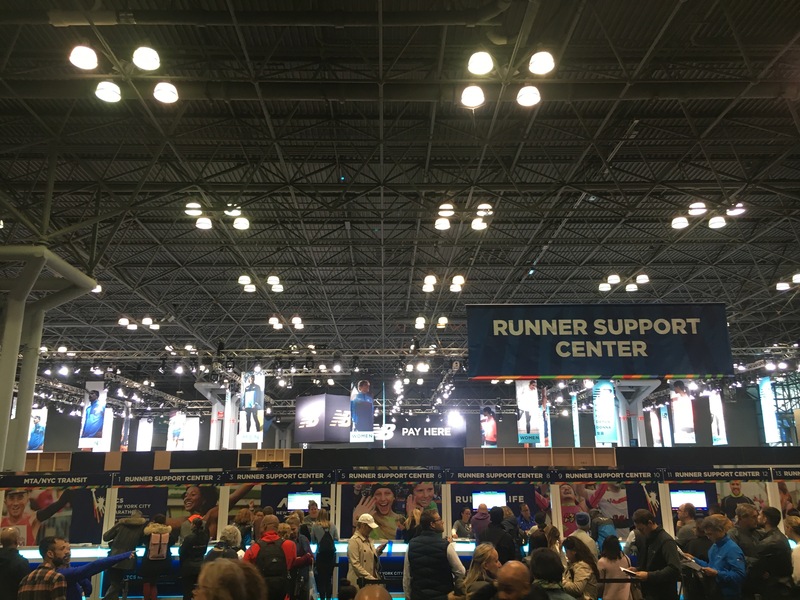 They had every possible piece of clothing, shoe and running gadget you could imagine. 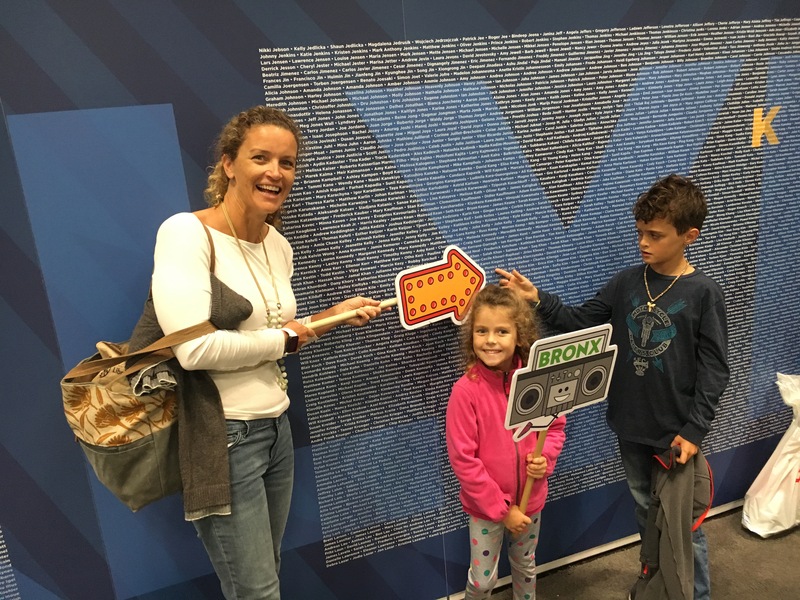 Monica found herself on a giant wall containing the names of every runner. 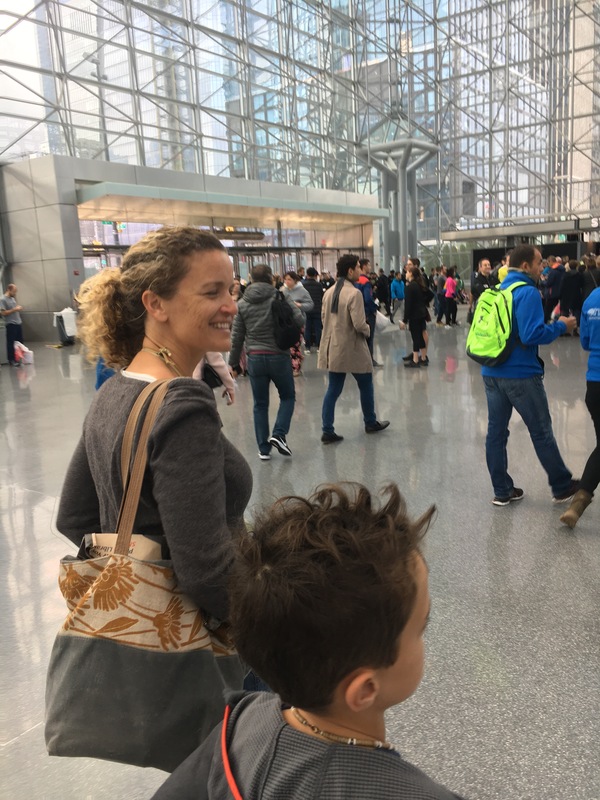 She drank up the enormity of the race and took in a seminar on race strategies. 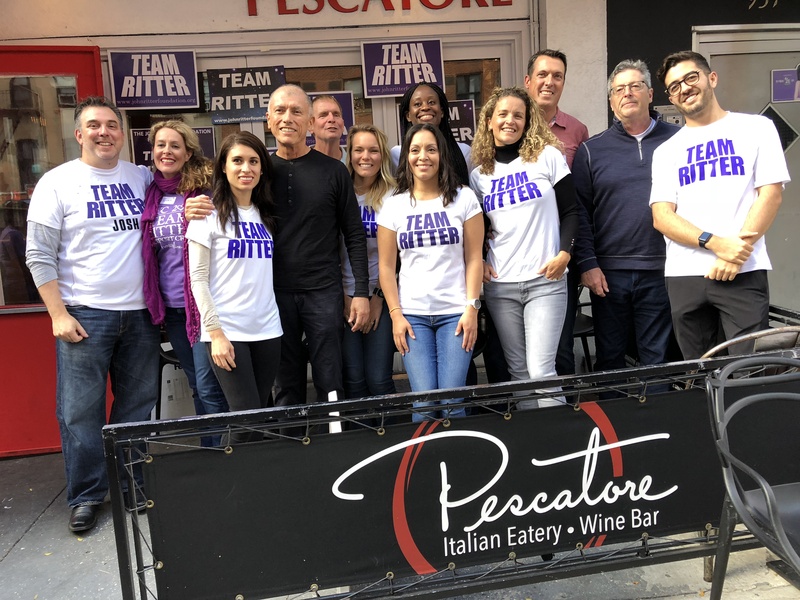 On the afternoon before the race, we joined other Team Ritter runners at an event hosted by Amy Yasbeck at Pescatore on the Upper East Side. Amy is John Ritter’s widow and starred on the hit TV show “Wings” and in the movie Splash Too. She’s a really funny and warm person. She took some time out of the reception to draw a mermaid with our daughter. Runners and survivors of aortic dissections posed afterward for a photo. The 5 a.m. alarm rang and race day was upon us. Monica crept around the room, burning, I mean making, toast and getting ready for her big day. 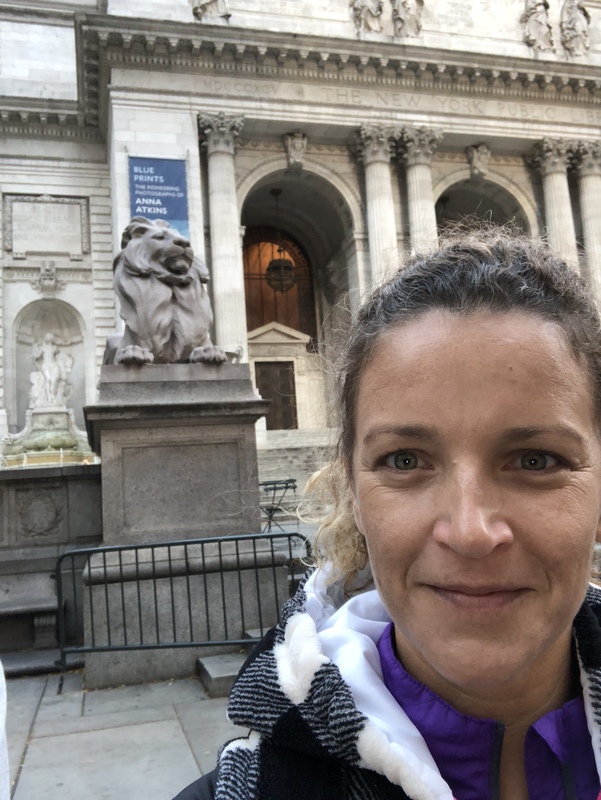 She caught a bus at the New York Public Library and rode to Staten Island where the course begins its run through the city’s five boroughs. 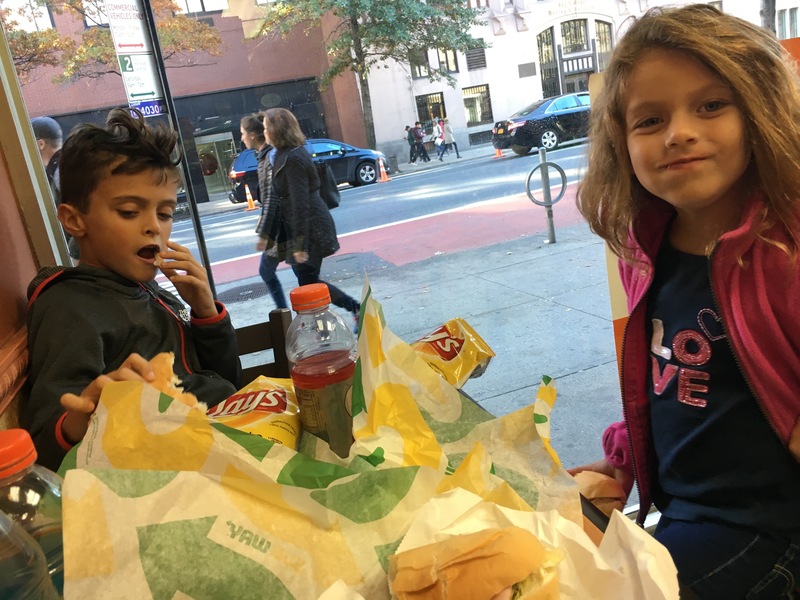 Meanwhile, the kids and I had a lazy morning, lunch, and a little window shopping before making our way to Central Park where we awaited her arrival at the finish. 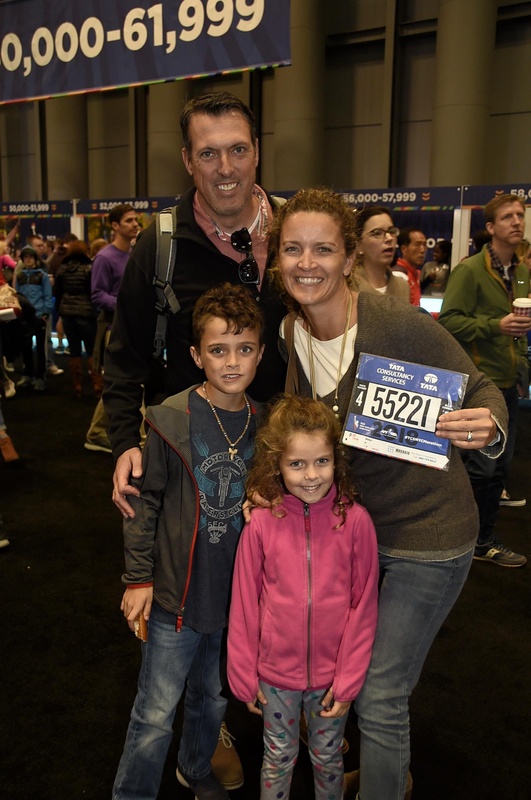 I’m beginning to suspect that running the marathon was just Monica’s way of getting in a day of sightseeing without having to drag the kids around. 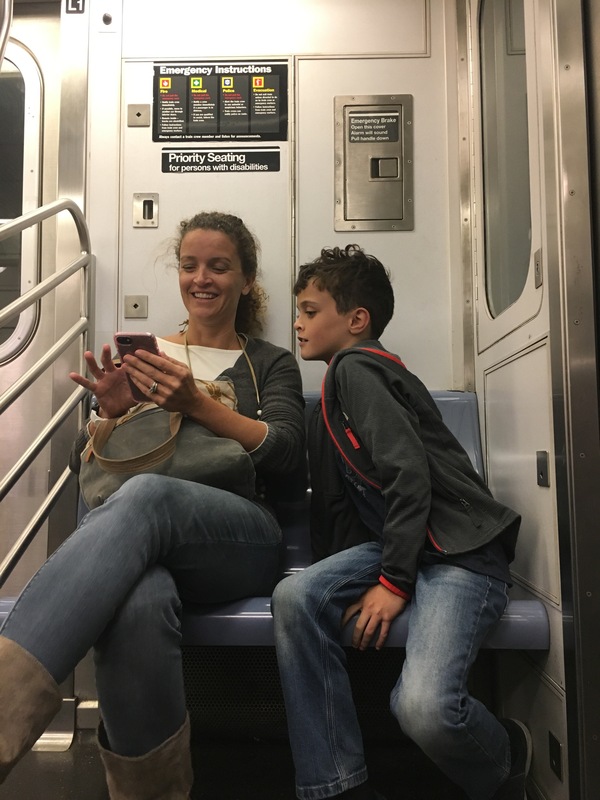 Yeah, we took a subway to… Subway. I know, I know, there are about 8,000 restaurants other than Subway, but they were hungry and it was right there. 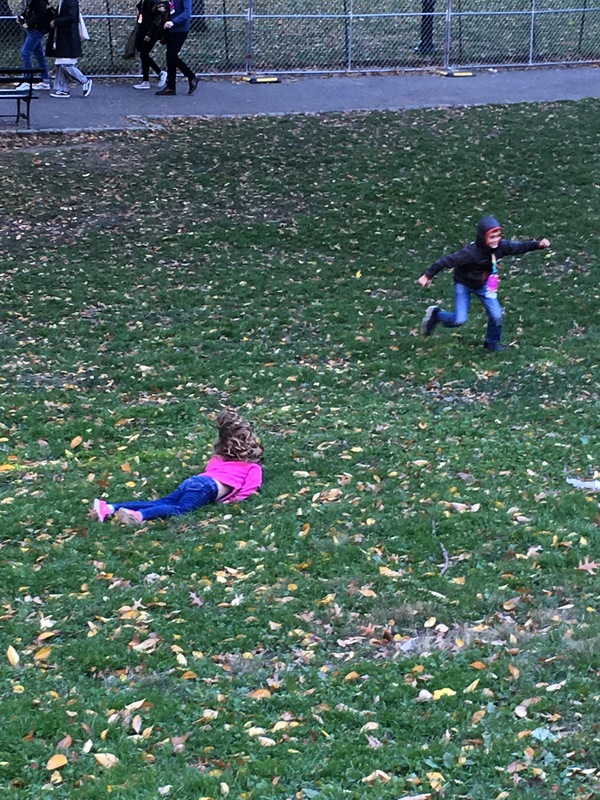 Then we went to Central Park where the kids stretched their legs while I watched some jogging. 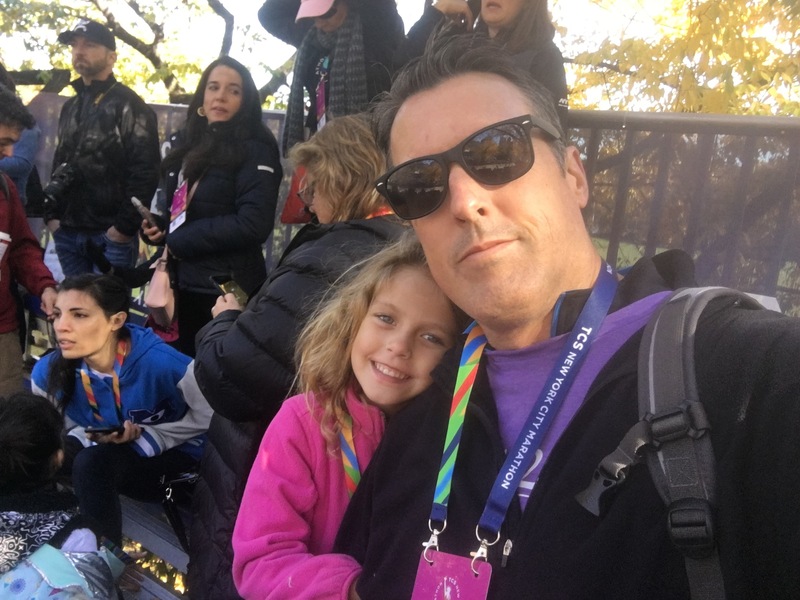 While I waited for Monica to cross the finish line, I searched the internet to find out if any famous people were running. I was lucky enough to catch NFL great and TV host Tiki Barber crossing with a little entourage. Monica beat Tiki by 15 minutes, but he started an hour earlier, so he finished before she did. 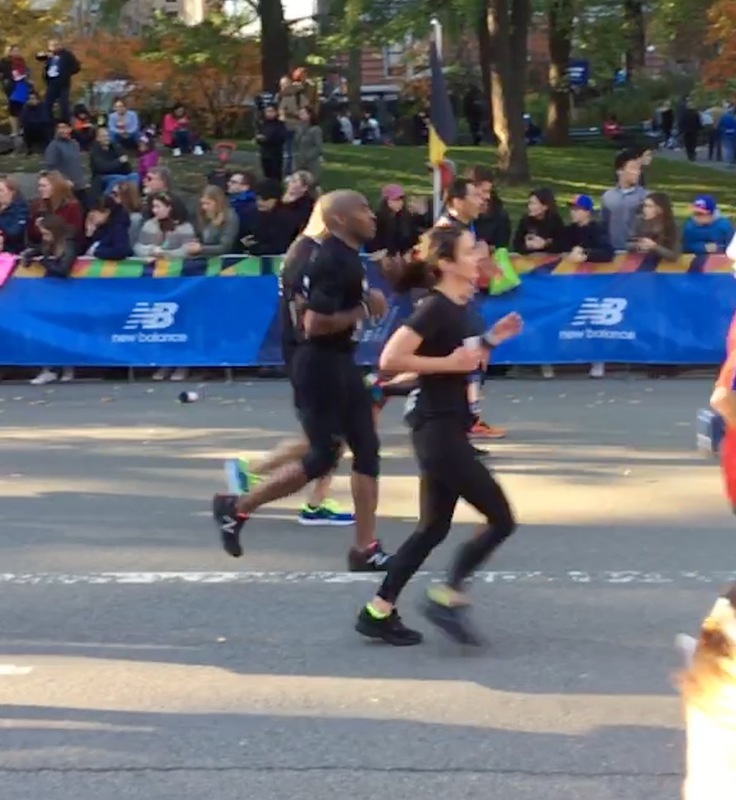 I also happened to catch a guy proposing to his girlfriend at Mile 26. And here she comes. At Mile 26 Monica still had a spring in her step. 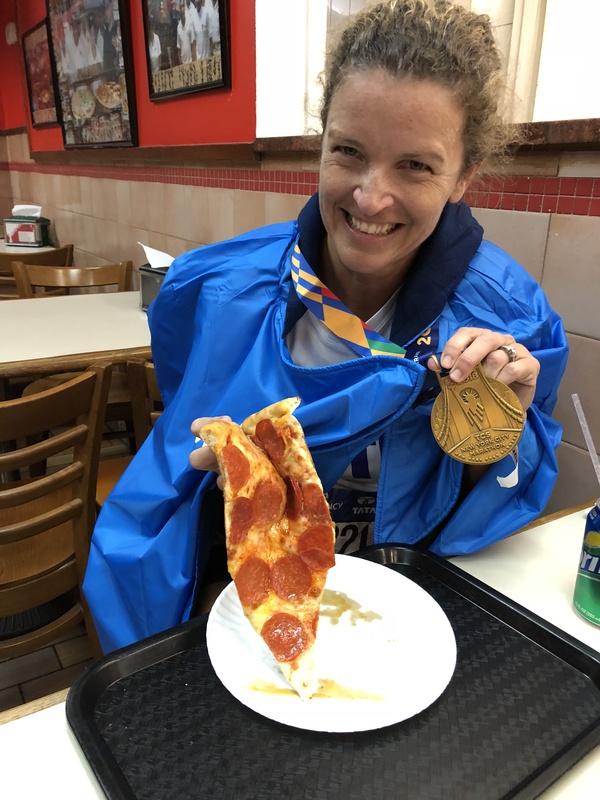 Note: she finished in 4 hrs 34 minutes. The race clock shows the time from when the competitive runners started (spoiler: the Kenyans and Ethiopians won) Monica came in roughly 27,000th place, which comes with no prize money. But out of 52,000 runners, it’s pretty impressive that about half of the field is behind her. 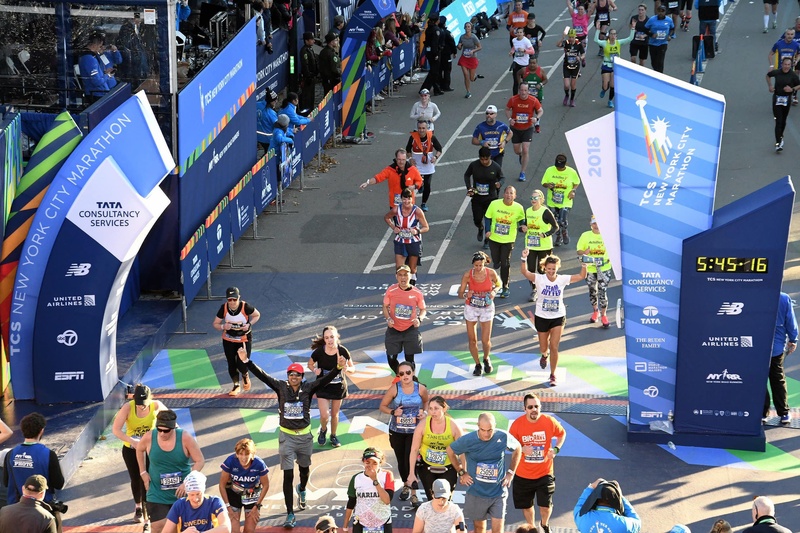 Once they cross the finish line, runners have a couple of miles to navigate away from the race venue and find family members in a sea of participants and spectators. After the race, she seized up like the Tin Man. No, she’s not sliding down the railing, she’s attempting to walk down stairs. We made our way to the 1 train and grabbed a slice of pizza near the hotel. One we got back to our room, we burned her clothes and she collapsed. The next morning was cold and rainy. 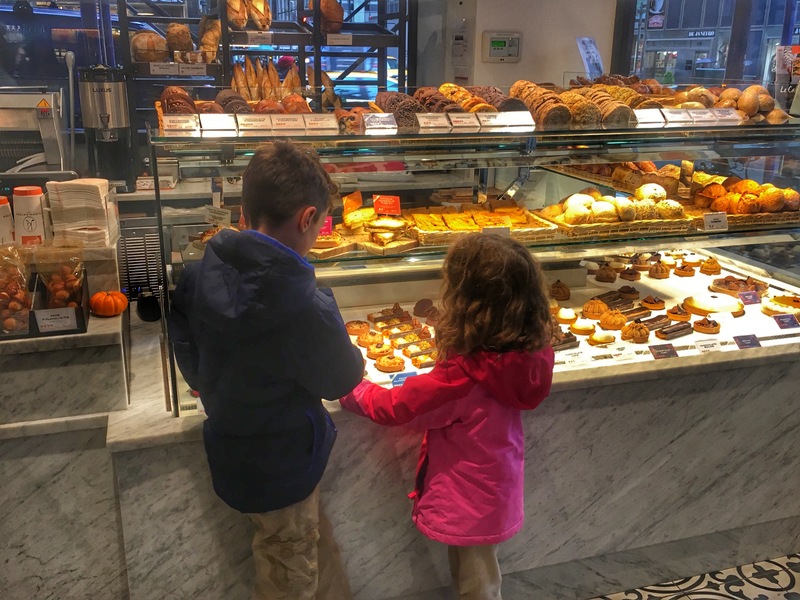 We filled up with a big breakfast at a diner and then stopped for pastries. (We were all sympathy eating.) Monica was excited to learn that her time was quick enough to get her name printed in the New York Times. I am beyond proud of Monica for what she’s done. 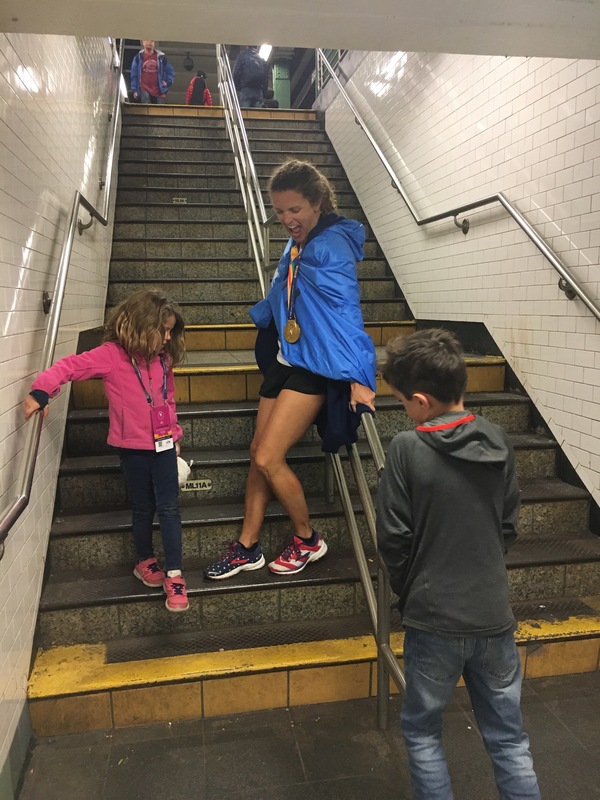 She didn’t just set a goal to run a marathon and accomplish it. 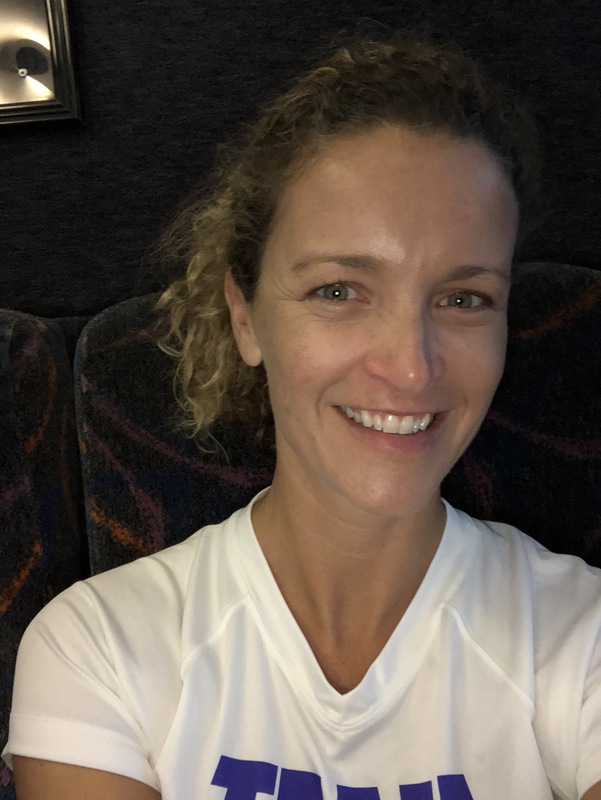 She found a love for distance running, and a community of people to enjoy it with. 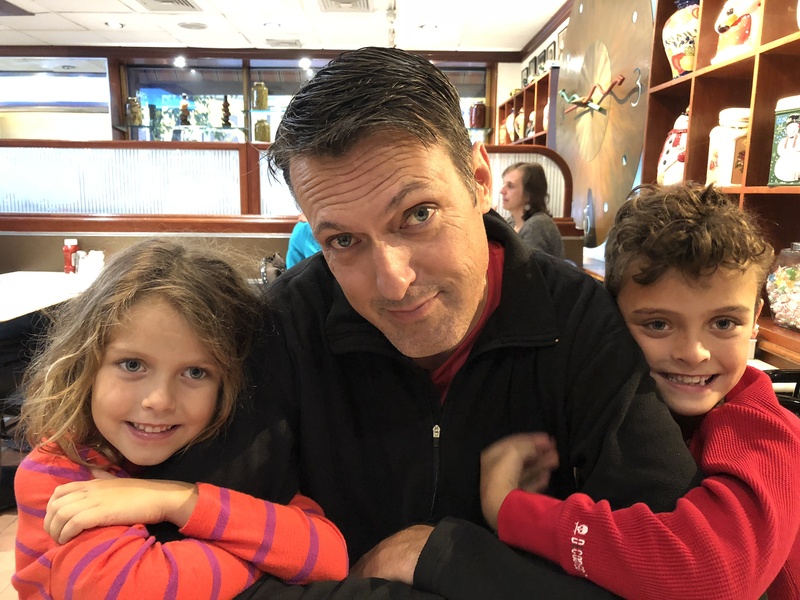 Let than a week after the race, she’d already gone out and run 8 miles, which for her is a warmup, but for most of us is more than we’ve ever run at once. 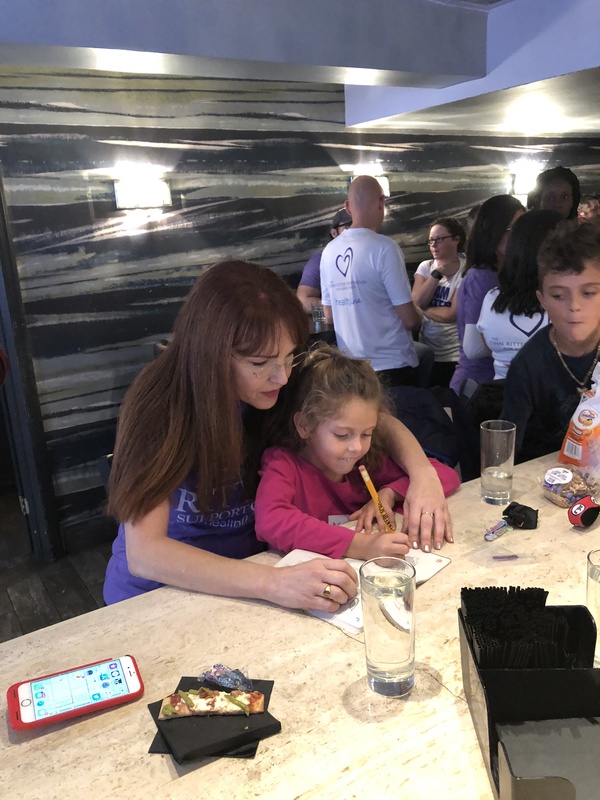 I want to thank everyone who contributed to her fundraising goal for the marathon. It really makes a difference for a disease that is so unknown. 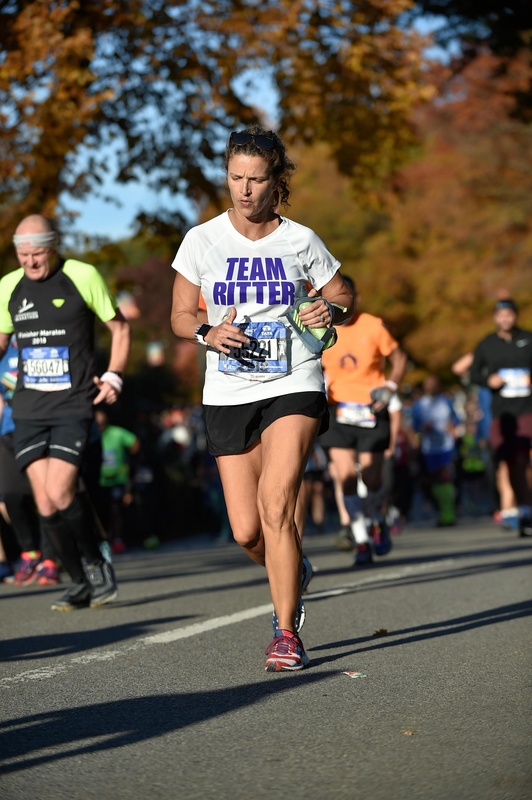 I’m touched that she chose to run for the Ritter Foundation because I never thought I’d find myself in the “survivor” category of anything like this. Having been there every step of the way, she’s a survivor too. And proof that adversity can build the spirit. CONGRATULATIONS to Monica and to the whole family. G-e-e-z, I have trouble running a block. Continue to keep us informed.